Need to build a learning management system (LMS) or e-learning website? You can build your own custom LMS website with WordPress. We’ve compiled a collection of the best LMS WordPress themes and plugins specifically designed for learning management system websites. The premium themes below provide a turn-key LMS solution and either include integrated LMS functionality or take advantage of various free and premium third party LMS plugins for the functionality. These LMS WordPress solutions allow you to build your own website cheaply and easily so you can create and sell online courses or training. They provide the design and facilitate all the functionality you might need such as: easy course and content creation, write lessons, add tests and quizzes, user registration and payments, set lesson and course perquisites, access reports and analytics, award certificates and more. LevelUp is a learning management system (LMS) WordPress theme from Tesla Themes. The premium theme is deigned specifically for LMS websites so you can share or sell online courses. It would be ideal for schools, universities, colleges, other education establishments and others wanting to sell courses online. LevelUp is a comprehensive learning management system that allows you to easily manage your courses, instructors and students. You can create and manage courses, lessons and quizzes, view statistics about students and trends, communicate with students (BuddyPress support), and sell courses with integrated PayPal and Stripe payments mentions or WooCommerce. LMS is a mobile responsive learning management WordPress theme for building a powerful and feature rich learning management system website. The premium theme combines with a number of quality plugins (for the functionality) for a professional LMS for teaching and learning online. LMS gives you features to create online courses, courses custom post type, lesson management, quiz system, teacher profiles, extended student profiles, video hosting, tracking course progress, questions system, ranking / rating system, attachments, paid and free courses, login and registration facility, courses advanced search and sorting and more. LMS combines the power of a number of free and premium plugins for functionality including: Sensei, BuddyPress, WooCommerce, Event Calendar, WPML, Mail-Chimp, and S2 Members. Design wise the theme is flexible and customizable with features such as: a visual page builder, 100% mobile friendly responsive design, boxed or wide layouts, 30 pre-defined colour skins, 4 header options, side navigation, multiple blog / gallery and shop columns, parallax scroll options and more. The Academy Leaning Management Theme for WordPress is not just a theme but a leaning management system you can use to share and sell your knowledge online. The premium theme has a clean and professional design suitable for any type of content or course you want to sell online. This theme provides the features you need for creating online courses and lessons including: courses (course subscriptions, course certificates, course ratings, course price, students list, student progress, and course statistics), lessons (lesson prerequisites, sample lessons, questions system, quiz system), extended user profiles, rating system, questions system, file attachments, embedding self-hosted media, tracking course progress, WooCommerce integration and more. The Academy theme also has powerful options pane that allows you to fully change fonts, colours, backgrounds, slider settings, switch between page layouts, create sidebars, edit contact form fields and more. WPLMS is a WordPress learning management system theme for e-learning and course management. It’s an extremely advanced and feature packed theme that combined the power of WordPress with numerous third party and custom plugins for a complete LMS that allows you to create and sell your courses online. WPLMS utilizes the power and flexibility of WordPress in combination with BuddyPress, bbPress, WooCommerce and 7 specifically built custom plugins to create a powerful learning management system that provides a complete online learning experience. WPLMS is also compatible with TinCan/XAPI specifications and a lot of popular plugins such as WP Coauthors plus, MyCred points system, BadgeOS, PMPro, DwQ&A and more. Some of the notable features of WPLMS include: a instructor dashboard (course stats, announcements, commissions chart, activities, send messages, news, to-do lists etc), students dashboard (course progress, contact instructors, course / quiz / assignment stats, news and announcements, online friends etc), front end course creation, courses directory page, course curriculum and course timeline, quizzes, statistics, shop, certificate customizer, support for audio and video, lots of custom widgets, live theme customizer, advanced options panel, a retina ready responsive design and much more. The Clever Course leaning management system (LMS) WordPress theme has been designed specifically for creating and selling courses. The premium theme can be used for selling courses online as well as offline, onsite courses / training at an establishment. Its suitable for schools, universities, colleges, and other education facilities. Clever Course includes the features and functionality needed in a LMS for managing courses, teachers / trainers, pupils, tests and quizzes, certificates, payments and commission and more. Some of the key features in the theme include: online course creation, online quizzes, student and instructor back ends, course badges and certificates, payment processing (PayPal or other payment processor), limitless page builder, unlimited colour options, landing page template, advanced admin panel, a fully mobile friendly responsive design, Google fonts, mega menu, Font Awesome icons, WooCommerce ready, and more. 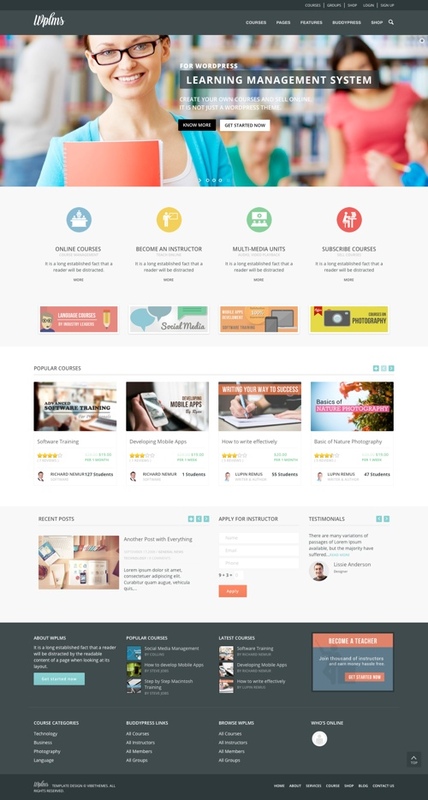 Guru is a LMS WordPress theme that combines the features of WordPress and a number of plugins to create a powerful learning management system that makes teaching and learning online easy for everyone. The premium theme effectively uses WordPress, Sensei, BuddyPress, WooCommerce, Event Calendar, WPML, and Mail-chimp. Guru provides the ability for creating online courses, teacher profiles, extended user profiles, lesson management, quiz system, video hosting, ranking / rating system, questions system, attachments, tracking course progress, WooCommerce integration, BuddyPress, Event Calendar, WPML Support and more. The core functionality is provided by Sensei a premium LMS WordPress plugin from WooThemes. With the Sensei plugin you can create courses, write lessons, and add quizzes. Set lesson and course pre-requisites, allow user registration, check course analytics and reports, and even charge for your course content using WooCommerce if you wish. Invent is an education WordPress theme with a professional look and design that works seamlessly with the popular LearnDash Learning Management System plugin for WordPress. LearnDash is a featured packed LMS without all the clunky setup that allows you to easily create and sell courses, set-up quizzes, automatically award certificates, download user reports and more. The Invent theme incorporates custom styling for LearnDash components. It also provides custom sidebars, page template for display of LearnDash elements or custom posts. Some of the other key features of the theme include: WooCommerce integration, 8 custom post types (team members, sliders, gallery, pricing plans, testimonials etc), intuitive options panel with 200+ options for easy control and customization, infinite colour schemes, Google fonts, unlimited header styles, parallax backgrounds, unlimited sidebars, retina ready icons, WPML compatibility, mobile menu, fully responsive design and more.